It was about time that this happened: my first cookery video. I love cooking and so it was a natural progression. Beauty addicts do not fear: the cookery is an addition to the beauty vids and not a substitution. Lipsticks will be back on a screen near you very soon! In fact, if you want some beauty p*rn, I can tell you that my face in this video is adorned with Tom Ford’s summer collection as well as the new NARS tinted moisturiser and a Shiseido cream eyeshadow. I don’t cook with any old crap on my face you know! I do hope that you enjoy this; it took me ages to get around to filming it, but it’s nice not to be stuck in front of that same old wallpaper with the same old camera angle. I’m trying to mix things up a bit! The aubergine (eggplant to U.S. readers) recipe shown in the video is one of my favourites. It’s a bastardisation of a Sicilian recipe called Caponata. Or something. You can add black olives to it if you want, or change the cheese, or up the chilli content. Play about with it! It makes a wonderful light lunch or supper if you skip the pasta, thus saving yourself about a zillion empty calories. I can’t resist pasta and would rather have a small amount than none at all, so that’s why I cook pasta in the video! I had walked a LOT that day though – I needed my carb fix. Enjoy. The written version of my recipe (my weird, gradually changed version!) is printed in full below the video pane. If you’d like to see my videos as soon as they publish then you can subscribe to my Youtube Channel. 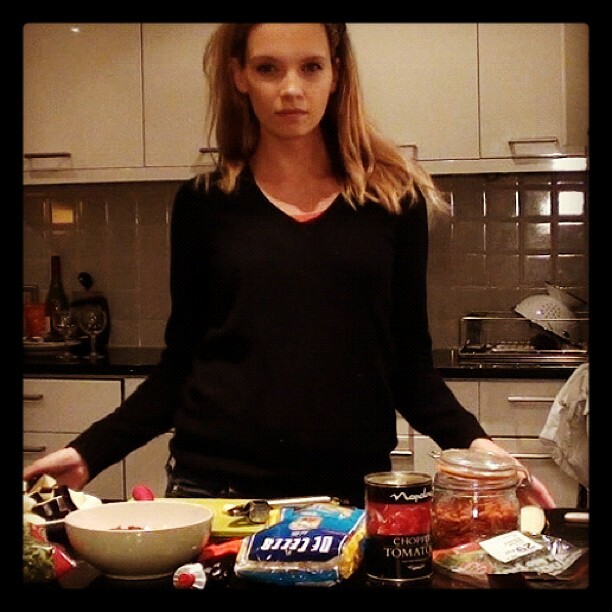 If you want some exclusive recipe action, then make sure you’re signed up to A Model Recommends: Exclusive. The first newsletter will be with you on the 1st June! 1) Cut the aubergine into slices 1cm thick (ish!) and then the slices into cubes. Try to get them KIND of the same size so that they cook evenly! 2) Heat about a tablespoon of oil in a deep frying pan. You can use less oil than this or even no oil if you have a good non-stick pan. The idea is to cook off the aubergine cubes so that they begin to brown slightly on the outsides. You need to keep the cubes moving in the pan so that they don’t burn! 3) After a few minutes of cooking off the cubes, take the pan from the heat and clear a space off to the side so that you can fry your crushed garlic in a bit of extra virgin olive oil. DON’T ever let the garlic burn, it tastes rank! Add the oregano and the chilli, and mix it all into the cubes. 4) Return the pan to the heat. You don’t want to burn the garlic so add your dash of balsamic vinegar to the pan and then the tin of tomatoes immediately, and stir in. Fill up the empty tin halfway with water and add to the pan. 5) Add the tomato puree and stir in. 6) Simmer your sauce for around ten to fifteen minutes – the aubergine cubes should be cooked through but NOT soggy. When you put the fork in to test them, you want them to be keeping their shape but not at all hard! Basically, if you taste one and it’s nice then it’s done – if it’s too hard you can always keep on cooking! 7) Add freshly torn basil leaves if you have them – no worries if you don’t, but it does add another dimension and makes the whole thing come alive. 8) Tear your buffalo mozzarella over the top. I’m adamant about good quality mozzarella – if it isn’t the real deal, don’t bother. Shave some parmesan over the top instead! 9) You can serve this stirred into penne pasta as I do in the video. I used 45g of dried penne as the sauce is pretty chunky and filling, but increase/decrease as desired! You can also serve with salad, chicken breast, lamb, steak, fish, whatever you fancy!